The seeds of the UIL were planted in 1904, when Dr. S.E. Mezes, president of The University of Texas, decided the state's foremost university needed to be of service to the entire state. At the time, it was felt that unless an outreach program was initiated, the university would become elitist and isolated from society as a whole. 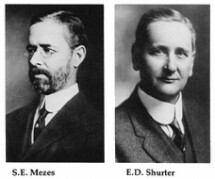 Mezes dispatched William Sutton, dean of the school of education, to visit Wisconsin, which had the nation's premier extension department, offering reference libraries, specialists as lecturers and assorted other off-campus services. On June 7, 1909, Sutton described the "Wisconsin Plan" to the UT board of regents, which promptly allocated funds for the creation of the UT Extension Bureau. The next year, Dr. Mezes created the Debating League of Texas High Schools as part of the Extension Bureau. Twenty-eight schools joined the League, which came under the direction of Dr. E.D. Shurter. He also appointed Professor Charles Ramsdell to investigate the need for a high school athletic organization. After talking with public school officials, Professor Ramsdell suggested organizing an Interscholastic Athletic Association. The proposal was approved and the UIL's two parent organizations, the Debating League of Texas and the Interscholastic Athletic Association became operational. In 1913, the Debating League and the Athletic Association merged to form the University Interscholastic League, which was centered in the Bureau of Public School Services, then a part of The University of Texas Extension Division. Today, the League operates as part of the University of Texas, under the auspices of the Vice President for Diversity & Community Engagement. Since 1910, the records and achievements of state high school participants have justified the decision of the University to support this program of public school service. The UIL has grown into the largest interschool organization of its kind in the world, and is the envy of similar groups nationwide. The UIL exists to provide educational extracurricular academic, athletic, and music contests. So successful is the program that one of every two high school seniors has participated in a UIL event prior to graduation. The initials "UIL" have come to represent quality educational competition, administered by school people on an amateur and equitable basis.